Marigold is also known by the names Pot Marigold, Mary Bud, Calendula, Mary Gowles, Holigold, and Golds. Marigold grows as a common garden plant throughout North America and Europe. The golden-orange or yellow flowers of Marigold have been used for centuries. The part of this plant used are the flowers. Marigold flowers were believed to be useful in reducing inflammation, wound repairing, and as an antiseptic. Historically, Marigold was used to help support various skin problems, ranging from skin ulcerations to eczema. Internally, the soothing effects of Marigold can be used to help support stomach ulcers and inflammation. A sterile tea of this herb was also applied in cases of conjunctivitis. 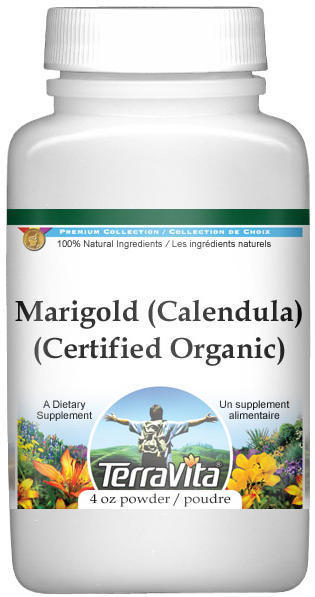 Marigold has been found to be antispasmodic, aperient, cholagogue, diaphoretic, vulnerary. The primary chemical constituents of this herb include saponins, carotenoids, flavonoids, mucilage, bitter principle, phytosterols, and polysaccharides resin. The flavonoids, found in high amounts in Marigold, account for much of its anti-inflammatory activity; triterpene saponins may also be important. Marigold also contains carotenoids. Investigations into immunity-building and anti-viral actions of Marigold are continuing, but at this time there is insufficient evidence to recommend clinical use of Marigold for immunity issues. There is, however, evidence suggesting use of Marigold for some viral infections. The constituents responsible for these actions are not entirely clear. As a cholagogue, this herb helps support gallbladder problems and to aid digestion. As an emmenagogue, Marigold can be of benefit in supporting delayed menstruation. The hormonal influences are likely to stem from the sterol fraction. An infusion of the flowers can be used for such gastrointestinal problems as ulcers, stomach cramps, colitis, and diarrhea. It is also useful taken internally for fever, boils, abscesses, and to help avoid recurrent vomiting. The fresh juice of the herb or flowers can substitute for the infusion. For external use, a good salve for wounds can be made from the dried flowers or leaves, or from the juice pressed out of the fresh flowers. The salve can also be used to support insect bites, bruises, sprains, pulled muscles, sores, and boils. An infusion of Marigold can be used to help soothe watery, irritated eyes, and for support in bronchial complaints. It can also be used frequently in the support for liver disorders. Additionally, it is thought to induce perspiration in case of fever. Marigold has been shown to help promote blood clotting and to help support capillary effusion. Recent clinical studies have shown that Marigold flower extracts support healthy blood pressure levels and have sedative effects. In 1955, an Australian patent was issued for the use of Marigold in supporting burns in humans. Although it contains no tannins, Marigold is locally astringent, due to its resin component.